We plan to eventually automate our site to support a blog, comments, a forum and purchases, but we currently only need a static website. This means limited cleverness on the client side and none on the server, just some basic html and a minimum of scripting for content and a css for the looks. In this post I'll explain how to host a "quick and dirty" static site on Google App Engine. It involves a few tricks but nothing too complicated. I've added a Links and tools section at the end of this post where you'll find all the resource I used (including to train myself). I hope you find the information useful and you enjoy crafting your site as much as I did. In September last year, Doug started rewriting Avoyd from scratch. At the time we only needed a presence on the internet. Our old website, which I'd written 12 years earlier, was still online but it badly needed a redesign (using tables for layout, difficult to maintain, etc...). We were already using Google Sites for our personal intranet. It's free, fast to configure and easy to use, great for our "we don't care about the looks" private space. So we decided to use Google Sites for our website as well. Whilst it is powerful, Google Sites turned out unsuitable for our public website. I won't start a detailed rant about it here, but I'll say that if at least the documentation had been up to date - or in some cases had existed - it would have saved me a lot of time and frustration. We ended up with a decent-looking 2-page site including a blog that served its purpose for several months. However, it wasn't the right solution for us in the long term. That's when we decided to build the site ourselves from scratch, and to use Google App Engine to host it. Personally, I find that writing the website manually is easier, and I'm neither an expert in this domain nor am I a coder. I'm learning on the fly as I implement the site with Doug's help. Let's get on with the practical tasks involved in setting up a static website in Google App Engine. Twitter Bootstrap is a simple (and free) way to make a website look sleek by using their predefined css. I wanted a slightly different look to start from so I used a css file from Bootswatch. They provide a few themes based on the bootstrap toolkit that can easily be tweaked. I first downloaded the bootstrap.css file from one of Bootswatch's themes and added it to my css directory. Next I added the html <link href="https://www.enkisoftware.com/css/bootstrap.css" rel="stylesheet"> to all my html files <head> sections. Finally I tweaked the css to get the looks I wanted. A side note on all the *.min.css and *.less files you'll encounter: I've not included (nor referenced them in my html) because a. it's easier; and b. I want to see the effects of editing my css file straight away. (as a side note, Doug also uses Font Awesome with libRocket for Avoyd's in-game GUI elements). I followed the same principle as with Bootstap: downloaded Font Awesome (* see note below for an easier alternative), added the file font-awesome.css to my css directory, then the html <link href="https://www.enkisoftware.com/css/font-awesome.css" rel="stylesheet"> to all my html files <head> sections. I also needed to add the fonts themselves: I simply dumped the "font" directory and all of its contents at the same level as my css folder. Once this is done, all you have to do to add an icon is to include <i class="fas fa-thumbs-up"></i> in your html, et voilà ! As an example of how handy Bootstrap and Font Awesome are, the box above was created with a Bootstrap <pre> tag and Font Awesome icons. Follow the Google App Engine site's download and installation instructions. Note: if you've never used the Google App Engine Python SDK, it's a good idea to do the Hello, World! example. You won't need to know more for the purpose of a static website and you won't need to understand the programming involved. In the root directory where you keep your static website (in this example, my static website is in directory static_website, under root directory my-gae-website, see previous section), add an empty text file and rename it "app.yaml". Open the Google App Engine Launcher (I'll refer to it as the GAE launcher). Set the application path to directory my-gae-website and select Add. Paste the default text below into your app.yaml and save it. You'll notice that the app "my-gae-website" in the GAE launcher immediately turns from red text to black. If you want, you can already run the "my-gae-website" application from the GAE launcher and view your website locally in your browser. However it may not show anything yet: you need to configure app.yaml to serve your own static pages. In the next section I'll explain how to configure app.yaml to serve a static website using our site as an example. This step sets the rules for displaying the contents of the website. 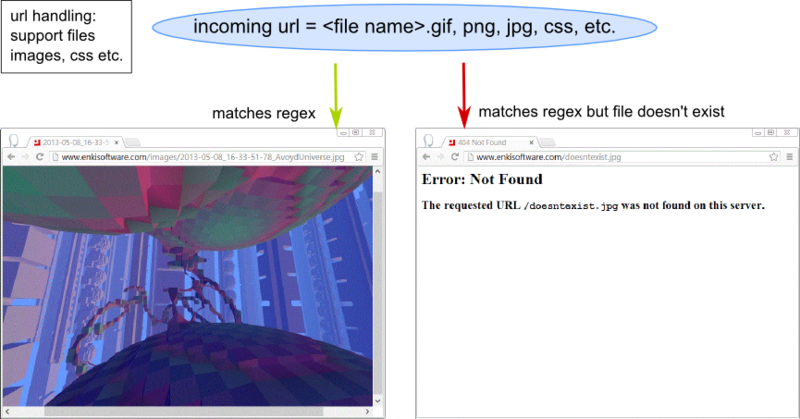 In other words, app.yaml describes what will be returned (web pages, images...) when specific urls are entered. We've found the syntax of app.yaml not completely straightforward so I'm going to describe in detail how I've configured it in our specific example. For a general understanding of the principles of app.yaml, see the links section about regex and app.yaml at the end of this post. If you want to skip this section go straight to the deployment part. #invalid url would return the default 404 not found page. served for the url above>. brackets. For further information, see the definition of "
Whenever a url is entered that doesn't match any of our files, we want to display our custom-defined file not found page so that people stay on our website. Note: there is an exception to this rule in the case of support files such as images, css... where we want to serve the default file not found error (see section below). Our custom file not found will be served for any url that matches none of the regexes described in the handlers section, except for the last: /.*. First of all we address the specific cases where we have unambiguously defined pages and files. 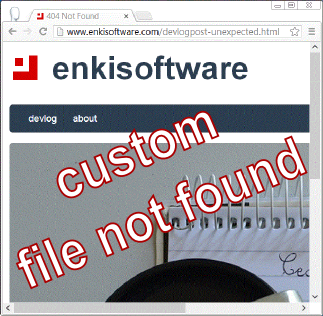 Root: If no file is requested in the url, for instance navigating to https://www.enkisoftware.com, we serve our home page which is (currently) devlog.html. Less specific files: I had to create individual pages for each blog post to work around a Disqus limitation. I chose a simple pattern for naming those posts since I can't predict how many nor how often we'll add them: devlogpost-<yyyymmdd-dailyIncrement>.html. To save having to update app.yaml every time we add a new post, I'm using this regex devlogpost-201[3-9][0-1][0-9][0-3][0-9]-[1-4]\.html. I'm sure you've noticed this regex is not perfect. Why? Because if someone enters a url that matches the regex, i.e. a valid date (though I'm sure you've spotted that e.g. the 32nd March will incorrectly be considered a valid date) which doesn't correspond to an existing devlogpost file, they'll get the default file not found instead of our custom file not found (because the custom file not found will only be served if the url doesn't match the regex). Now I would prefer the custom file not found to be served (any suggestions welcome), but I'm going to automate the site at some point so this solution will do for now. We match images and support files (css, fonts etc.) based on their filename extension. If the file doesn't exist, we want to serve the default file not found so the error can be handled automatically by third party sites that e.g. link directly to images. In other words, in this case, we don't want to serve our custom file not found, as it wouldn't be processed by third parties. From the GAE launcher, run my-gae-website and view your website locally in your browser. This is a workaround for Google App Engine Launcher requiring that I enter my email and password each and every time I deploy. Whereas when I use the command prompt interface I only have to enter the details once per session. Unfortunately Disqus doesn't support more than one comments stream per page. To keep the number of pages to a minimum whilst the site is static, I wanted to have all the blog entries on one page devlog.html. Since that wasn't possible, as a workaround I created an individual page devlogpost-*.html for each blog post with its own comments area. I then duplicated each post on devlog.html, each with its Disqus comment counter which doubles as a link to the corresponding devlogpost-*.html. The links simply have #disqus_thread appended. As an example, in the devlog.html source, you'll find the link <a href="devlogpost-20130411-1.html#disqus_thread">. Note: to implement this I didn't need to use Disqus Identifiers. html knowledge is necessary if you write your web pages manually, and css is useful to understand if you want to customise the bootstrap css file or make your own. CSS positioning: try rainbodesign's tutorial if you find the Code Academy explanations confusing. (I found that using bootstrap, in particular their grid system, meant that I didn't need in-depth knowledge of css positioning). You'll need a basic understanding of regular expressions (a.k.a. regex) to edit the app.yaml file. If you're looking for a step by step introduction to regular expressions, I found Udacity's CS262 course very helpful. They address regex in Unit1. If you're happy with just the transcripts (no login required) you'll find them in the course wiki.